The best vegetarian dining experience in Bellingham is without a doubt at Pepper Sisters. But this post is not a restaurant review. (If you wish it was a restaurant review, wander on over here: 10 Reasons to Love Pepper Sisters.) 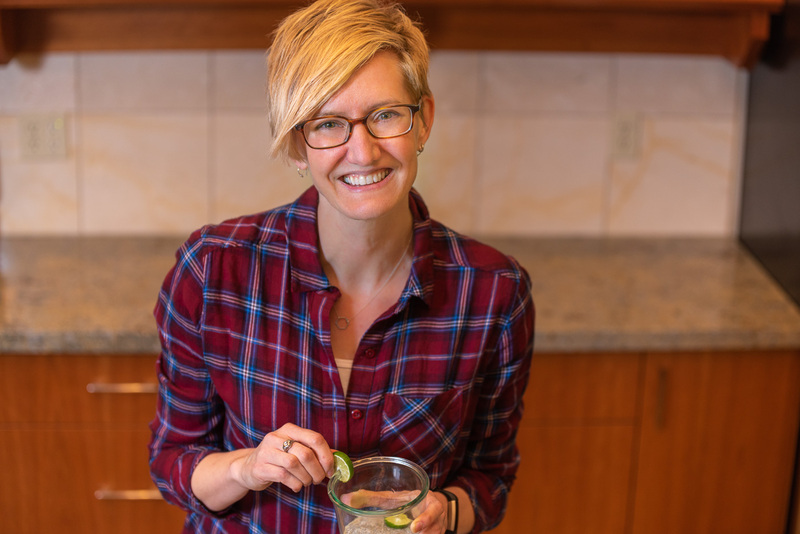 This post is, however, about a recipe inspired by one of Pepper Sister’s most unique side dishes. Like any good joint serving southwest cuisine, they have the standard beans and rice, of course, but they also have something you don’t see very often: posole. It’s hominy cooked in a spicy tomato sauce with the most wonderful chewy texture. 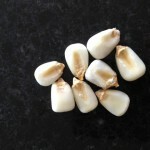 Hominy, sometimes called nixtamal, is a type of corn. Once the outer skin is taken off, it’s soaked in an alkali solution and dried. According to the Whole Grains Council, as long as bran loss is minimized during this process it’s considered a whole grain. 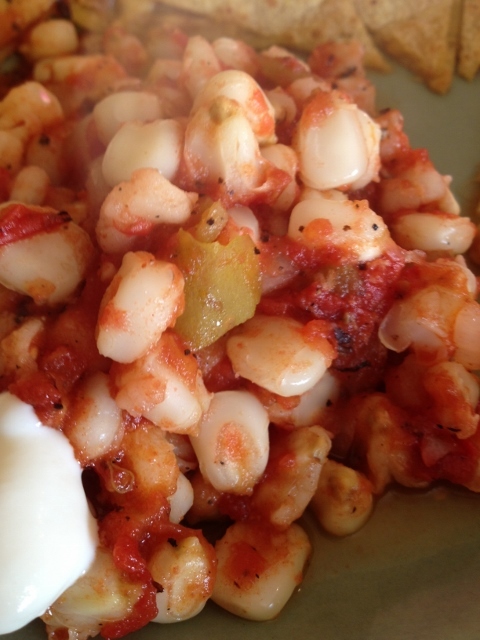 I’ve made the recipe I’m sharing with you today with both canned hominy, and dry hominy cooked from scratch, with great results. 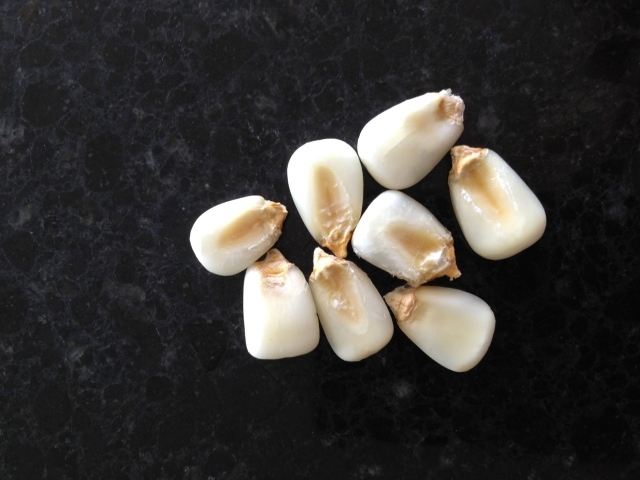 It can be tough to find dry hominy unless you have a Mexican grocery nearby, but I ordered mine online from Rancho Gordo. My version simmers the hominy in a spicy tomato sauce then adds chiles and toasted pumpkin seeds to round out the flavor. This Creamy Posole Casserole could be a main or side dish. We had ours with beans and cheese quesadillas, but I think it would be nice alongside a salad as well. 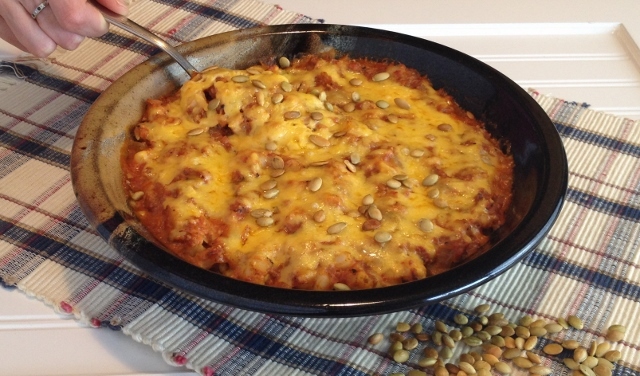 I took my lead from this recipe and decided to try baking it as a casserole, but in a pinch I think you could serve it right from the skillet. I can’t handle too much spice, and this is plenty hot for my tender tongue. But it would be easy to adjust the diced green chiles and chili powder to your liking. I found the sour cream helped tame things a bit. It worked as a dollop on the side when serving, or as I’ve written in the recipe, stirred into the casserole before baking. I added pumpkin seeds for flavor and protein, and they kind of end up disappearing into the tomato sauce…in a good way. Just a third cup added 22 g of protein to the recipe. And one cup of this quick and easy casserole serves up 15% or more of the daily value for vitamins A and C, and minerals calcium and iron. This dish could be vegan if you left off the sour cream and cheese or used non-dairy versions instead. The sodium looks high at 860 mg but I actually think the real value is less. I’m not sure my nutrition analysis program accounted for the reduction in sodium from draining and rinsing the hominy. This method of draining, rinsing (and waiting) reduces the sodium in canned beans and vegetables by 40%. 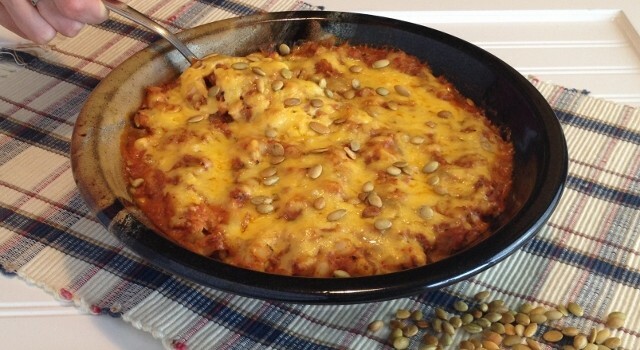 You can serve the sour cream on the side, like in this photograph, or stir it in before baking. Heat olive oil in large skillet over medium heat. Add onions and cook for 3 to 6 minutes or until softened. Add garlic and cook for 30 seconds, being careful not to burn it. Add tomatoes, chiles, hominy, pumpkin seeds, cumin, salt, chili powder, and black pepper. Cook for 3 to 5 minutes or until bubbling. Remove skillet from heat. Stir in the sour cream. Pour posole into a 9-inch deep dish pie plate or similar-sized casserole dish. Sprinkle with cheese. Bake uncovered for 20 to 25 minutes or until cheese is melted and posole is bubbling. Garnish with whole toasted pumpkin seeds and serve warm. Creamy Posole Casserole is inspired by the posole at Pepper Sisters restaurant in Bellingham, Washington and Taste of Home's Southwestern Hominy Casserole recipe. I toast my pumpkin seeds in a small cast iron skillet over low heat for about 6 minutes, or until they're golden brown and done popping. And I used a mini food chopper attachment that came with my immersion blender to grind them up. To puree the canned, diced tomatoes I just dumped them in a 1-quart liquid measure cup and used my immersion blender to smooth them out. If you give this recipe a try and enjoy it, I’d recommend keeping an eye out for posole when you’re dining out. You might get some inspiration or enjoy someone else’s creative interpretation of this classic dish. Or you could always make it at home and just pretend you’re eating out. Do you have a favorite way to prepare this chewy whole grain? Your timing is perfect! I need a new recipe for a family dinner this weekend and to take to a potluck — I’m going to make a double batch! That is good timing! And it comes together pretty easy. I hope the fam and the potluckers like it! Thanks for the recipe, this was a delicious vegetarian casserole. My co-worker even asked for the recipe, since the leftovers I was heating up in the microwave smelled so good! Hi Stacy. I’m so glad you enjoyed it! I just checked out the related post on your site – so cool that you made it your own.